The Neon Celery Kitchen: Chicken and Rice "Stoup"
When my husband said I could pick the color for the walls of the kitchen in our new house, I picked a paint called "neon celery." Everyone thought I was crazy. It turns out that the color is just bright enough, just retro enough, just different enough to have worked. People have very strong opinions about Rachael Ray. I've heard it all--she's annoying, her recipes lower our standards for food, she's just cashing in, etc, etc, etc. Well, I'll tell you this. The woman knows how to get dinner on the table in 30 minutes, and when you are a new mom, that is invaluable. Over the last nine months, I have fallen in love with Ms. Ray's recipes and cooking/writing style. For quick meals, she uses very little processed ingredients--from the recipes I've picked (and there have been a lot of them since Jasper was born), the most packaged ingredients I've used are canned broth and some frozen veggies. Not bad at all. And the recipes really deliver--of the many I have tried, we have only disliked one and had one complete disaster (which was not the recipe's fault--it was cook's error). I will openly admit that I own almost every Rachael Ray cookbook, and I will further state that they are used more than any other single author on my shelves at the moment (which says a lot, considering that I have close to 200 cookbooks on those shelves). The weather has been getting brisk here in New England, so I decided to make a Chicken and Rice "Stoup" recipe, from 365: No Repeats. "Stoup," for those not well-versed in Rachael Ray-speak, is somewhere between a soup and a stew. This one was warm, and comforting, with perfect seasonings. And, it was super easy to make. Very little active time was involved, so that dinner could get on the table and the baby could be entertained all at once. This recipe is a keeper. I'm sure it will grace my table throughout the cold weather season. Heat a Dutch oven over medium-high heat. Add olive oil and butter. When butter melts, add the chicken to the pan and saute until lightly golden on both sides, about 4 minutes. Add leeks, bay leaf, carrots, celery, and thyme. Cook for about 3 minutes, until the leeks wilt down. Add all 6 cups of stock and bring to a boil. Stir in the rice and cook until rice is just tender, 15 to 18 minutes. 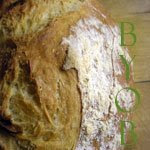 (There was no instruction in the original recipe for the cover to be on or off, so I left it off. It worked fine this way.) Adjust salt and pepper seasoning to taste. 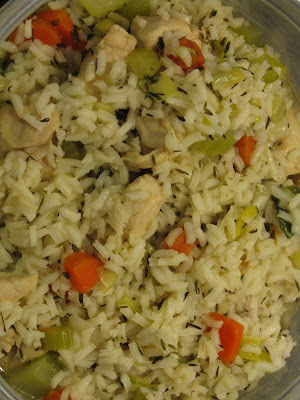 Note: If you have leftovers, the rice will absorb all the liquid, giving you a "chicken and rice" meal, with no "stoup." This was fine with me--it was still delicious--but, if you want the soup consistency, have another can of broth on hand to thin it out when you reheat. I am a mother, reader, and cookbook addict who loves to tinker in my neon celery-colored kitchen, and spend countless hours reading to her children. Here are my adventures, musings, and memories.